Chris Chelios is an American retired professional ice hockey defenseman. He was one of the longest-tenured players in the National Hockey League, and is a three-time Stanley Cup champion - one with the Montreal Canadiens and two with the Detroit Red Wings. 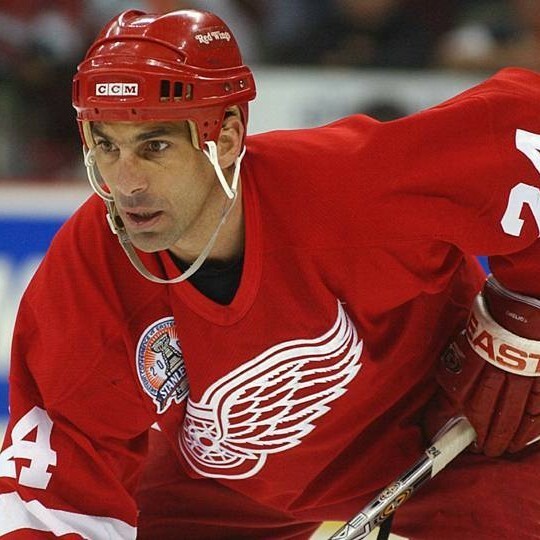 Chelios played for the Montreal Canadiens, Chicago Blackhawks, Detroit Red Wings, and the Atlanta Thrashers. When he was called up from the AHL's Chicago Wolves to play for the Thrashers during the 2009–10 NHL season, Chelios was the oldest active player in the NHL and the second oldest of all time, had played the most games of any active player in the NHL, was the last player from the 1981 NHL Entry Draft still active, and had the most career penalty minutes of any active player. Chelios currently holds the record for most games played in the NHL by a defenseman, is fifth overall with 1,651 games played, and is tied with Gordie Howe for most NHL seasons played with 26. On May 1, 2009, he appeared in the playoffs for an NHL record 24th time, having missed the playoffs only once (1997–98) in his career. In 2017 Chelios was named one of the '100 Greatest NHL Players' in history. Book me to a custom experience!